This third and 100th Anniversary edition of a very popular guide that compliments the other excellent guides from the same authors. This is an expanded and updated edition with GPS locations and over 400 full colour images. One of the challenges for writers of guide books of any kind is the fast moving development of electronic navigation devices. Historically, map references and navigation co-ordinates have been used to assist the location of the less obvious areas the guide recommends. With the increasing use of hand-held navigation devices, it is becoming important to include GPS locations. DESCRIPTION: This third and 100th Anniversary edition of a very popular guide that compliments the other excellent guides from the same authors. This is an expanded and updated edition with GPS locations and over 400 full colour images. One of the challenges for writers of guide books of any kind is the fast moving development of electronic navigation devices. Historically, map references and navigation co-ordinates have been used to assist the location of the less obvious areas the guide recommends. With the increasing use of hand-held navigation devices, it is becoming important to include GPS locations. At some point soon, a publisher is going to produce an Application for smart phones and tablet computers that will comprise the complete guide book electronically with navigation windows and inter-active directions. Whether this will be as satisfying as a printed paper guide is debatable. There are no available figures to show ho many readers buy specifically to aid a planned visit to the battlegrounds. 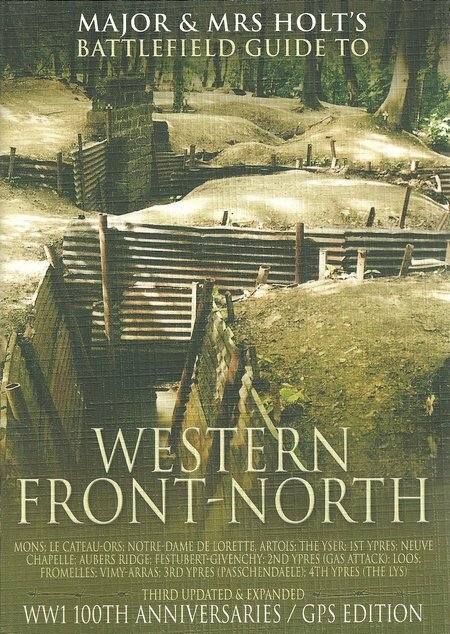 This guide, like its sisters, is an excellent companion in a library of WWI histories and a proportion of these guides will be purchased by readers who do not intend to visit the battlefield. However, once the guide is to hand there is a fair chance that many will decide to move to the next stage and visit the battlefield.